Oor FM’s pure dead brilliant an’ gets called a’ sorts o’ names She’s jist oot there lapping up her walks an’ playing a’ kinds o’ games She disnae need her minders or the hassle that they bring She’s happy openin’ up a park then playing oan the swings. She’s ane o’ us an’ loves it, giein’ selfies wi’ the weans Kissin’, cuddlin’, haudin’ them as if they were her ain She disnae dae refusals even when she needs a rest She sees the crowds as right good pals an’ no’ as bloody pests! A’ the wummin coorie roon’ while their men a’ kinda hide But they’re smilin’ fae a corner and burstin’ oot wi’ pride, It disnae matter who ye urr, she wullnae pass ye by Oan the streets or in a shoap or runnin’ through the rye! Ah huvnae met oor FM but heard she’s goat a heart o’ gold Ah only know this through some pals o’ mine an’ the stories ah’ve been told But croass her and ye’ll get a tongue that’ll make ye want tae greet An’ she’ll answer a’ yer questions even when she feels dead beat! There urnae many country’s leaders who love tae meet the likes o’ us Fae private jets tae first class trains, she even jumps the bus Ah said before she’s ane o’ us an’ long may this queen reign Jist keep daein’ whit ye dae the noo an’ we’ll vote ye in again. 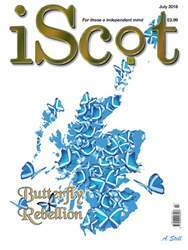 The best Scottish Glossy on the planet ! An absolute belter of an issue with all the best crack going on in Scotland today. We can turn this around. Tartan Connections Space: the Final Frontier!